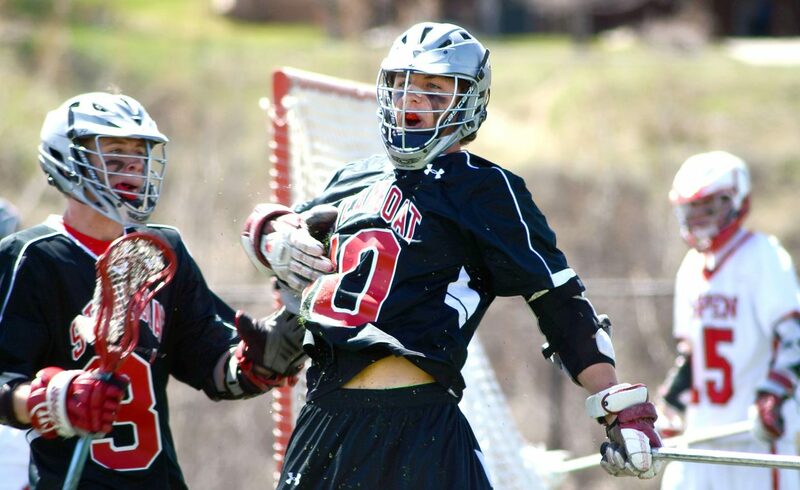 Ben Wharton, right, celebrates a first-half goal in a game against Aspen this spring. Wharton serves as captain of his three respective sports teams: tennis, hockey and lacrosse. Steamboat Springs senior Ben Wharton is about as rare of a breed as Sailors athletes come. Very few varsity athletes can claim they are three-sport athletes — boy or girl. Wharton can, but he isn’t just another name on the roster, someone who scores a goal here and there, or wins a match a few times a season. Steamboat’s Ben Wharton slides a shot past the Pine Creek goalie in January. Officials overruled the score in a controversial call. The senior serves as captain of his three respective sports teams, dominating on the court, the ice and the field in tennis, hockey and lacrosse. This season, Wharton was a state qualifier in those sports, making him the 2014 Yampa Valley male athlete of the year. He advanced the furthest of any Sailors tennis player in the fall at the state tournament in Pueblo. In the winter, Wharton guided Steamboat hockey as the team captain and was lead goal scorer into the state tournament, losing to Front Range powerhouse Lewis-Palmer. And as an encore to four years of round-the-clock Sailors sports, Wharton and the Steamboat lacrosse team were a win away from playing for a state championship. Wharton and the Sailors couldn’t rally quite enough in the final quarter at Ponderosa, falling in the 4A lacrosse Final Four to Ponderosa, 17-13. But as one door closes, another opens for Steamboat’s premier athlete on campus. A few days after the loss at Ponderosa, Wharton walked the campus halls with a University of Colorado shirt, where he will play lacrosse next year for the Buffaloes. But even in Boulder,where Wharton hopes to lead his new squad to another national championship (CU beat Arizona State on May 17 for the MCLA National Championship), there’s something about this little mountain town he’ll never forget, and he leaves a school that likely never will forget him, either. And he’ll miss the people he’s grown up with and competed alongside since moving to Steamboat in third grade. They’re the group to which he credits all his successes, such as being named a Foothills Conference honorable mention all-leaguer in hockey, with a team-leading 13 goals, as well as a first-team all-state attack in lacrosse, with a team-leading 56 goals, which landed him a spot in the Colorado all-star game.